Sales Performance Solutions from Performance Methods Inc. The best way to gain an understanding of what it takes to become a “top-performing” sales organization is to help top-performing companies grow their sales performance to the next level of effectiveness. PMI’s impressive client base includes flagship companies from a variety of industries, and in working closely with these market leaders PMI has developed a full range of integrated sales best practices solutions. PMI solutions are modern and contemporary, and are built upon a proven customer engagement model that is based on understanding how the customer defines value. PMI believes that without the support of sales leadership as proactive field coaches, most sales effectiveness initiatives fail. PMI’s consultants understand this quite well, as most of them served as senior sales executives or Chief Sales Officers in their pre-PMI careers. With this in mind, PMI Sales Performance Solutions are supported by a full suite of sales coaching tools, questions and techniques to equip and enable sales leaders to drive adoption and ensure traction. PMI also assists clients in their implementations of enabling technologies by providing advice and consulting assistance as needed to ensure that the technology is, indeed, enabling the sales team to receive more value from their PMI Sales Performance Solutions. Most PMI consultants have had direct experience with CRM/SFA technologies, and our solutions have been implemented with all of the leading brands. Through the assessment phase of each PMI engagement, client sales best practices are identified and verified with client sales leadership. Asking client top performers questions such as “How are the winners consistently winning business?” and “When you win, why do you win?” enables PMI to develop a foundation of sales best practices focused on how and why clients win business. These client-specific best practices are merged with industry best practices to form a collaborative, phased approach for aligning, positioning and differentiating the client’s solutions and value with their customers drivers, objectives and challenges throughout the sales process. Whether a client’s territory assignment methodology is based upon geography, product/solution lines, customer size, named accounts, or most commonly, a combination of these, effective Territory Management programs can be the difference between sales success and failure. Performance Methods works collaboratively with our clients to create and deploy customized Territory Management programs that will lead to greater accountability for the growth, development and management of sales territories. This approach to territory ownership is deployed through a model that establishes norms and metrics for operating the territory as though it is a business. These basic asset/liability and profit/loss concepts introduce a longer-term territory perspective to the field sales organization that is based on territory business planning, where the assigned account executive or account manager drives the business and growth of the territory using a business planning approach. Pipeline Management for each territory is based on the Sales Process and Best Practices model developed through the assessment phase of each PMI engagement. PMI has learned from extensive work in this key discipline that the only way to ensure effective and accurate Pipeline Management is to base the measurement and flow of sales opportunities into and out of the Sales Pipeline on the client’s own Sales Process and Best Practices model. Leveraging this model of client-specific best practices allows the account executive and sales management to assess the current status of sales opportunities through each stage of the sales process by using their own organizational experience working and winning sales opportunities. Forecast Management is based on the concepts of Pipeline Management and Sales Process and Best Practices. PMI works in collaboration with each client to determine the milestones or activities for each stage of the sales process in order to fill in the blanks and provide the right recommendations and measurements for effective execution. From this framework of best practices, sales management is better equipped to understand the status of opportunity and the actual probability and timing to close business based on their own selling experiences and history. By building upon a solid foundation of proven best practices and executables, PMI’s approach to Forecast Management has proven to be more accurate and deployable, enabling clients to remove the guesswork from their sales forecasts. These interactive, high-energy, skills-based workshops help salespeople and account managers recognize the competitive advantage of presenting a clear and consistent value message to their customers before, during and after the sales process. The focus of the message is “customer defined value” which is derived from gaining an understanding of the customer’s drivers, objectives and challenges early in the sales process. Responding with tired techniques that are “feature/ benefit/response” oriented simply isn’t good enough if you are going to align effectively with your customers, position your solutions, differentiate your value and win business. PMI’s Value Articulation and Planning to Engage™ workshops provide the tools, skills, best practices and probing questions that enable salespeople and account managers to drive more effective customer value conversations and higher competitive win rates. PMI’s Sales Opportunity Management and Planning to Win™ solutions are based upon the realization that as our clients’ go-to-market strategies differ – their competitive strategies and opportunity plans must differ, as well. To this end, PMI provides clients with customized opportunity planning solutions that are tailored to fit the way that they do business – as opposed to dated, “out-of-the-box” methodologies that assume all clients to be equal in their go-to-market needs. Plan to win sales opportunities by selecting and deploying the right sales strategy to drive sales execution and achieve competitive advantage. Create space between themselves and their competition! Through PMI’s Planning to Win™ solutions, customized opportunity assessment criteria are developed, customer-specific value propositions are built, effective account teams are engaged, sales strategies are deployed and action plans are implemented. In collaboration with our clients, PMI builds the opportunity planning framework that best fits their business, equipping account executives and account managers with the tools to proactively plan to win competitive sales opportunities, drive revenue and meet and exceed their sales quota objectives. Today, many companies around the world are faced with a perplexing problem: a significant amount of their business comes from a relatively small percentage of their “strategic” or most important customers, yet in many cases, these strategic or key customers do not consider these suppliers to be as strategic or important to their business. PMI believes that one way to address this potentially dangerous disconnect is through the implementation of proactive Planning to Grow™ skills, tools and job-aids to assist account teams in managing and growing strategic customer relationships. As one of the recognized global leaders in strategic account management best practices, PMI assists clients in deploying and implementing account Planning to Grow™ programs that provide them with higher account growth rates, stronger opportunity win rates, more effective deployment of resources and increased levels of customer loyalty. 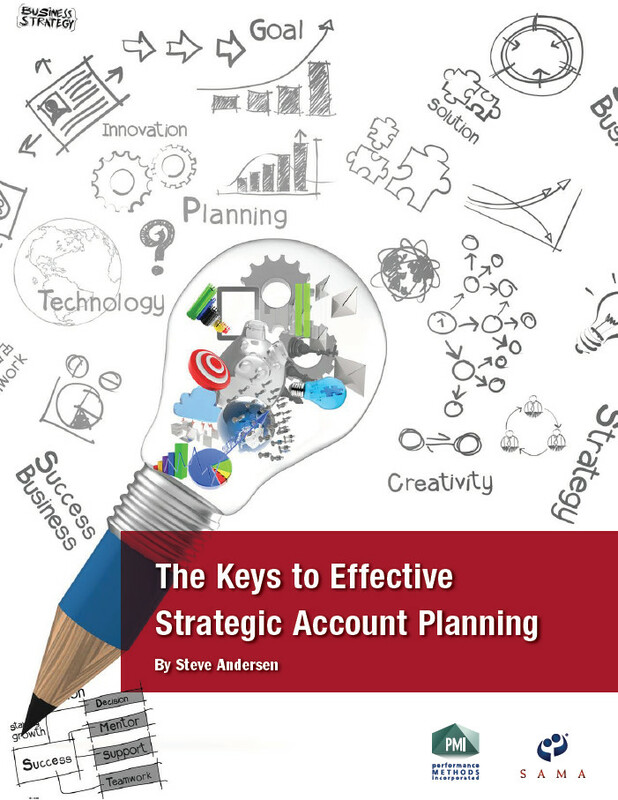 Through our extensive account management work, we have defined and published The Keys to Effective Account Planning for clients and this methodology provides the foundation for each PMI implementation. PMI clients benefit from a contemporary, “new millennium” approach to account business planning in which account teams meet together to learn and implement best practices, skills and tools, and build actionable account plans for specific strategic customers. To ensure ongoing customer/supplier collaboration, PMI also facilitates annual and quarterly meetings between our clients and their strategic customers to ensure that objectives and expectations are being met and exceeded by both parties. Have you ever felt that your customer is more strategic to your business than your organization is to your customer’s business? This is one of the significant and perplexing problems confronting many suppliers today. Yet when PMI interviews our clients’ strategic customers, (and we have interviewed hundreds of them) we frequently hear the customer state that they would like for their customer/supplier relationship to be more strategic. PMI has determined through our extensive account management and planning work at the regional, key, strategic and global levels that many customers are interested in planning proactively with their “most important” suppliers – but their suppliers rarely ask them to do so. As a result, we have developed a complete, integrated approach to implementing and deploying Collaborative Planning with Customers for our clients. PMI’s Collaborative Planning with Customers methodology includes a full suite of tools and deliverables that have been designed in our work with many of the world’s most recognized corporations and deployed with their most strategic customers. PMI clients that have implemented our Strategic Account Management and Planning to Grow™ solutions drive their account management effectiveness to the next level through the deployment of Collaborative Planning with Customers. The evolution that we have all witnessed as “old millennium” sales best practices have given way to new, more contemporary approaches to sales effectiveness and has become a driver for today’s sales managers and leaders. New, more modern, collaborative and effective sales coaching has become a critical component of all successful deployments of sales performance solutions. PMI recognizes the challenges of today’s sales managers and leaders and has developed a high-impact, practical approach to sales coaching. By observing and leveraging the primary coaching skills and best practices of our clients’ top sales managers, PMI provides a unique program of coaching skills, tools and techniques to drive implementation, adoption and traction of each of PMI’s Sales Performance Solutions. Sales leaders and managers serve as proactive coaches in all of PMI’s sales training workshops and are provided with up-front “coach the coaches” training to help them understand what they can expect in terms of value from their PMI Sales Performance Solutions. Sales managers and leaders are also equipped with client-specific coaching tools and application-specific questions and job-aids to drive adoption and traction after initial training. When sales leaders and managers are equipped to coach their first deployment of a PMI Sales Performance Solution, they learn a set of proven field sales coaching skills and are provided with a set of application-specific tools and questions to help them create value for their salespeople and account managers during sales execution. This coaching foundation is built upon with each subsequent deployment of new PMI solutions, which means that the sales managers and leaders continue to use a common set of practical, real-world coaching skills across all of PMI’s Sales Performance Solutions. PMI’s Must-Win Strategists / Coaches provide sales and account teams with a competitive strategist in the form of a senior, experienced back-stage coach. After all, every company has must-win deals for the month, quarter, and year. And they certainly have high-value customer relationships under attack from competitors. Winnable sales strategies with relevant, supporting tactics and action plans. PMI’s Must-Win Strategists / Coaches can help you assess where you stand with your most critical accounts and opportunities while there is still time to make needed adjustments, determine your best course of action based on proven approaches and best practices, and equip you with the insights and actionable awareness to ensure that you maximize your likelihood of winning in those situations where losing simply isn’t an option. PMI’s Sales Talent Selection and Hiring to Win™ solution is based on decades of in-the-field development of a proven hiring process and a supporting tool set. The solution provides PMI’s clients with the tools and services to significantly increase hiring effectiveness so that success in the area of talent acquisition is consistent and predictable. Ongoing industry research regarding the short tenure of salespeople, account managers, and sales managers underscores the importance of selecting and hiring the right talent for the specific job roles a company requires to achieve their short- and long-term goals and objectives. That same research shows that a hiring mistake can cost a company from $200,000 to well over a million dollars. Through PMI’s Sales Talent Selection and Hiring to Win™ solution, managers are provided with the tools, processes, and support required to hire the right talent the first time.